My Shy Gray Cat, 18" wide x 24" long. Cotton fabrics, tulle, rayon and cotton threads. Before Digital, Digitally, 20" wide x 16" long. Fabric and paper collage art quilt depicting the past and present of photography. Digitally manipulated photos, stitching, colored pencil. If A Tree Sings, 32" x 42", $450.00. Fabric collage with hand lettering and Swarovski crystals. This quilt was part of Hands All Around 2013: International Quilts, sponsored by Quilters Newsletter magazine. It won Honorable Mention in Art Quilts category at the 2017 Smoky Mountain Quilt Show. SOLD Le Coq Rouge, 18" wide x 24" long. Collage of printed fabrics from France, vintage lace, bead, button, twisted cord. Sweet Memories, 34" wide x 42" long, $275.00. Crazy patchwork made of embroidered and embellished Indian fabrics from outgrown girls' clothing, ribbons, metallic braids,rick racks, shisha mirrors, bindis. This quilt was chosen for the 2015 American Quilters Society Quilt Show in Lancaster, Pennsylvania. The Dreamy House. $475.00 29" wide x 35" long. Batik and Stonehenge fabrics, tulle, organza and a little lace. 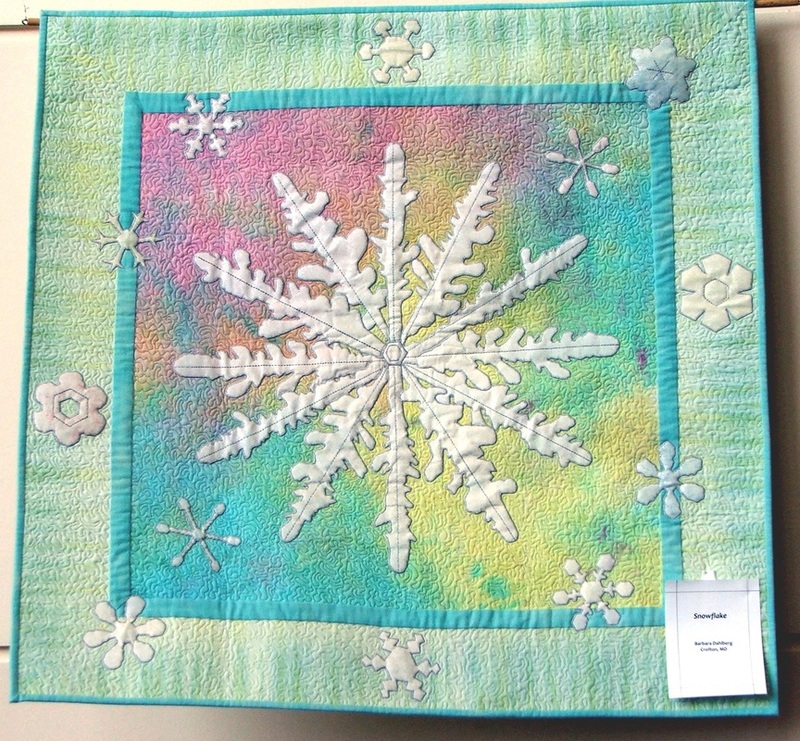 The Snowflake, 34" x 34", $500.00 Award Winner - Second place Small Wall Quilts. Quilts By the Bay 2010; Second place Small Applique Quilts, Southern Comforters 2011 Quilt Show. It Started With The Button, 36" x 36", $500.00, Layered applique of batiks, cottons, metallic mesh, ultrasuede, pleather and fairyfrosts; handmade button. Crystal Symmetry, 37" wide x 28" long, $600.00. Made from Stonehenge fabrics, embellished with Swarovski crystals and a spiral shell bead. Quilt can be hung horizontally as shown or vertically. Hanging sleeves for either direction are sewn on the back. Masks, 36" x 42", $500.00. Embellished fabric masks inspired by Native American ceremonial masks. Award Winner - Second place Art Quilts, Southern Comforters 2010 Quilt Show. Memory, 28" wide x 22" long. $275.00. For the house I used a stencil and acrylic paint mixed with sand to create texture. The woman's head is made from black organza which is semi-transparent. French Quarter, 26" x 35", $225.00. Homage to the places and events of this famous section of New Orleans.